Can you accept death, make time to grieve, gain freedom and comfort others (grieving)? There is a crack in everything That's how the light gets in. As I have been slaking off jet lag and the luxury of a jam-packed two-week vacation, I watched a movie over the weekend about a widower who can barely tolerate life without his spouse until he meets a new friend. At one point, he tells her she is the crack in his dark world. The notion speaks strongly to me, then in Quaker worship and, now. In worship, I was moved to consider the death I have been living. I admitted I had been struggling and just "wanted to get on with it as the Friend across from me said – or, better, without it. I find the advice to grieve very helpful. To take the time, so I can live in the light, my light, and follow Christ's path (freedom), so I can get on with that." One more Friend ventured: "Accepting death means living in the present. There's only now." 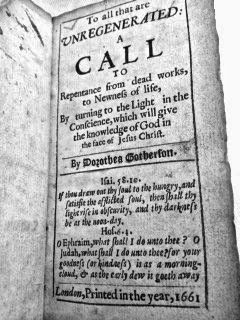 I returned to the London Friends Center to spend precious time with a slight book published in 1661 by my Quaker ancestor. She, too, called for death, the death of a Godless society. She was overcome with the message, to the point of publishing a book, presenting it to the King (Charles II) and addressing the whole of England, whom she felt lived under great darkness. She begged, pleaded and prayed for England to turn toward the light before it was too late. Her words are just as relevant today. I walked to the British Museum, processing my time with the book, grateful to have experienced it personally. 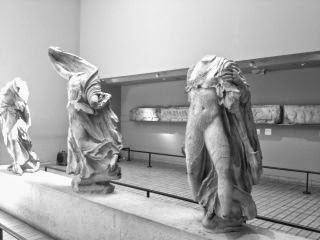 There, I headed toward the Elgin Marbles for a quick visit. Strolling the great halls of white marble, unearthed from their true homes and on display, I felt death: the ancientness of the pocked stone, the costumes of long ago and the unlikeliness of these magnificent figures lounging in a staid room and not atop the Parthenon. A few days later, participating in a Night of Adoration at Sacre Coeur in Paris, I encountered the resurrected Christ and the other side of death. 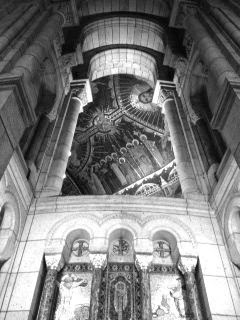 During my midnight silent prayer shift, I focused on the image of Christ overhead, painted in white and gold on the dome, his heart shining and the rays of what I call Christ energy radiating to all. To me that is the promise of Christ: we each are completely loved. And I believe that is the freedom mentioned in the Quaker query. Love is enduring and conquers even death. I am repeating that mantra as I mourn the very recent passing of my childhood Methodist minister, who also happened to be serving temporarily at my Quaker Meeting when I was led to return. It was such an easy and natural transition that I know God's hand was in it all. Let me grieve for the life I am leaving behind. Let me cut the strings. • How have I been acquainted with death? • Have I allowed time for grief? • What freedom lies at the other side? • From what must I die psychologically? I’m tired of cigarettes and urine. Enclaves of homeless camped out on one mattress as if it were an apartment, eyes boring into onlookers, imploring “Madame, Madame.” Train strikes mitigated day by day that strand a pair of young Irish women on their way to Taize with sparce funds in one of the most expensive cities in the world. Three cities, as many countries and 12 days after leaving the States, I am ready to settle back into a simple routine, mundane as it may seem. I long for my own bed, fluffy cat and everyday ways. It’s good to leave home, travel exotic places, meet interesting people, try a new language, feast on foreign delicacies and see the masterpieces of the world. But normalcy calls me now. I have had my fill for awhile, until I get the itch again. I can tell I am ready for home. I’ve gotten lazy about trying to speak the native tongue and can’t fathom another multi-course meal. The once novel subway system seems seedy and a necessary evil. Walking, no matter how many miles, is preferable. I am getting more aggressive in shoving through crowds and hardened to the impoverished, though I still have the ability to offer a prayer. My soul needs to rest. I have been broadened and expanded, become wiser and more diverse. Spirit has touched me as I set eyes, however briefly, on the Book of Kells, held and read the fragile 1661 book published by my Quaker ancestor, a woman with her own circle of believers, and again during an overnight pilgrimage to Sacre Coeur, silently praying until midnight with a scant few in the magnificent basilica. A shiver of knowing – spirit recognizing spirit and creative energy connecting through time – raced through me as I walked Montmartre in the footsteps of Picasso, Van Gogh, Monet, Toulouse-Lautrec and others I so admire. Gazing at the thick layers Van Gogh chiseled on canvass capturing what lays beyond the naked eye’s ability to comprehend awed me. At my last meeting with my spiritual director, she hurriedly printed off copies of a daily meditation for a Celtic pilgrimage. I packed them, hoping to keep up, understanding it would come in inconsistent chunks. Still, it connected the disjointed segments and reminded me of my mission, the theme of all pilgrims: to open themselves to the world in truly finding home with Spirit. • Alli, the young Australian we met in Dublin journeying around Great Britain and France for a few months before switching from healing others to teaching children. • Stephen, our Dublin cab driver who packed in as much as a seasoned tour guide between our guesthouse and the ferry. He loves his city and loves sharing it. That seemed to be a theme among the Irish. • Friends Center Quakers with whom I shared worship as they mourned the passing of one of them. Their query asking how one accepts death moved me to consider my own struggle to let my false self die and totally surrender to Spirit. • Tabitha, the Friends Center librarian, who tenderly offered me the precious book intuiting its personal meaning. • The London Tube guard who rescued me from an almost-scam and also the scammer. • Kate and Eva with whom I waited at the convent. Together, we found shelter. • The magnanimous French women and family with a Downs-Syndrome daughter who embraced me at convent meals. They spoke no English and I, very little French. We parted with an “au revoir,” kissing each other on either cheek. I was compelled to linger in an embrace with the daughter. We connected at the heart level. • The Sacre Coeur nuns who graciously received me, served a beautifully simple supper, offered me a comfortable private chamber and opened their worship. • My sister in law with whom I can share comfortable silence. She and her husband are living in Paris for several months and we caught up for dinner. She quietly unvelied her daughter’s new adventure into acupuncture training and as a wounded healer. • The homeless all over Europe, but especially the maimed begging at churches and families encamped on mattresses. • The Foyer Café at L'église de la Madeleine, where inexpensive multi-course lunches help feed, shelter and care for the homeless. • SCNF rail guards who made sure I squished into the train along with the rest of my family. • Christy Ennis, a gentle and friendly Irishman we met on the flight from Paris to Dublin. He’d spent several days playing his concertino at a folk-music festival in Normandy. • Our midnight cab driver who deposited us at a second Dublin hotel, waited to make sure we had a room and offered to take us on, for free, if not. • Kathleen with whom I shared the seven-hour flight to Philadelphia from Dublin. She’s recently widowed and forcing herself to visit a stateside daughter. I am opened, full, grateful and bless each of these individuals and experiences. • How does travel open me? • How can the negatives shape me in a positive way? • How can the wonders of the world help me appreciate home? • Where is my spiritual home?